Unless you’ve been away from the internet or not in contact with any woman, you’ve undoubtedly heard of Pinterest. Over the last few months, traffic has surged to the site, with January 2012 traffic already a third of that on Twitter. Surprisingly, the company was launched in 2009 by co-founder Ben Silbermann, and it has just recently taken off into mainstream society. The problem for the founder? Like YouTube and Twitter experienced in their earlier days, Sibermann is struggling to make the site turn revenue. Without any advertising model currently on the site, Pinterest is living on funds from investors. I have heard from Pinterest that an advertising model will be released in a few months, but I am guessing they will start out slowly. I’m always surprised that entrepreneurs like Sibermann never come up with revenue plans when starting the sites, but I guess that is just the marketing side of my brain speaking! As Pinterest evolves, I’m sure we’ll see many changes to the site. It’s already valued at $200 million, and that number will surely rise in the months ahead. Pinterest is an online pinboard where users share and “pin” photographs to their Pinterest profile, which acts as an online scrapbook. A user can separate their scrapbook into different boards, each of which would contain photos centered around a different category or importance. Popular boards include “My Style”, “Recipes”, “Places and Spaces”, and “Products I Love.” Users can create, name, and add boards to their scrapbooks as they wish. As a user adds photos to their boards, the photos show up in their follower’s feed (think Newsfeed in Facebook). To “pin” photos into their boards, users can pin photos pinned by the users they follow, browse the site by category, search the site, upload a photo, or pin a photo from their browser while surfing the web. Why is Pinterest the Next Big Thing? Contrary to the adoption of many new forms of technology, the site is especially popular with women. Women have found it is the perfect place to share crafts, recipes, home ideas, and clothing styles. This use is gaining the interest of many brands, who have realized this is the new social platform. Companies like Nordstrom and Whole Foods have created their own brand pages, connecting with Pinterest users by sharing clothing and recipes. As users see these photos, they can click through to Nordstrom.com to shop or learn more about the Whole Foods food used in the recipes. Content is king. Share relevant photographs with your followers. Brands often struggle on social sites like Facebook and Twitter because they only post brand content. Pinterest makes it harder for brands to do this, and that’s just what we need. Followers don’t want to see your logo or your products. Think of what your products could be used for and how they fit your followers’ lives. Post photos that followers will repin and thus share with their followers. For example, for dog food, post photos of cute dogs, children playing with puppies, or puppies doing funny things. Comment on your photos. This will make your photos searchable, and the comment will repost when a user repins the photo (if they choose not to write their own comment). If you’re a retailer, place the product’s price in your photo’s comments. This will add a price sticker in the corner of the product’s photo. Link it. Photos can link to websites. Link the photo to your ecommerce site, a store locator, your Facebook page, or your website. Make it conversational. Remember that social media is about a conversation with your audience. Don’t just share your own photos. Re-pin photos from your followers. Make it a contest. Create a board where one user a week can get their design/style, etc displayed to all of your followers. Follow the right people. Like Twitter, it’s not about quantity, it’s about quality. Following great people gives you access to relevant content. Promote your profile. 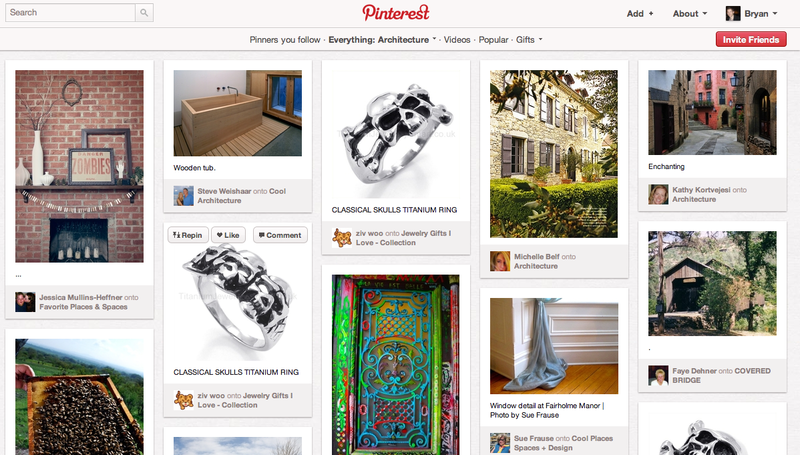 Post links to your Pinterest boards on your website and other social networking sites. Traffic to the website — which lets users create online scrapbooks to share images of projects or coveted products — has grown tenfold over the past six months. In January, the number of visitors on Pinterest.com was almost a third of that on Twitter.